Ah, Fourth of July. The holiday conjures up visions of American flags, fun in the sun, BBQs and fireworks. 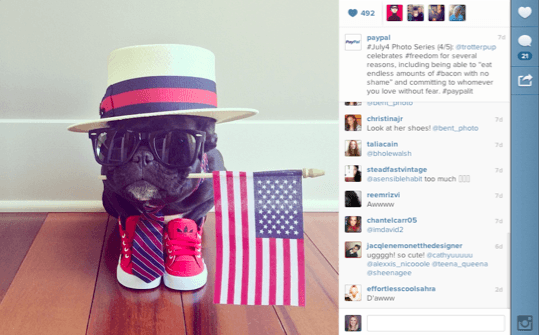 While many companies created social media posts around the holiday, PayPal’s patriotic pup stole the show. Shared both on PayPal’s Facebook page and Instagram channel, the words adorable and clever come to mind. How can you not smile and feel compelled to share this image? Delve deeper into the post and you’ll see that this pup frequently dons unique hats, sunglasses and other apparel, much to the delight of her more than 165,000 followers. For more, follow @trotterpup on Instagram, it’s a visual treat. The key takeaways here are to embrace creativity and build partnerships with incredible content producers as it makes sense for your company. It’s easy to get stuck in a social media image rut, so working with a third party can help to inspire unique new types of content. 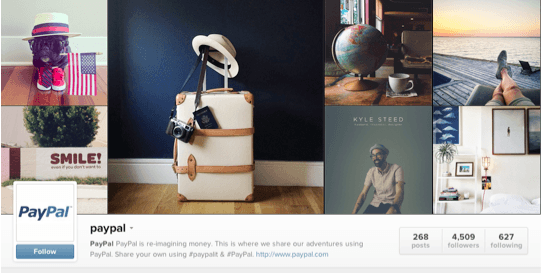 This is precisely what PayPal is doing by working with influential guest Instagrammers including @keikolynn, @kylesteed, @danielseunglee, and more. If you’re not able to work with third parties, it’s also smart to regularly follow and check in with the types of content your fans are sharing. They are already advocates of your company and their interests and content could open a new window to lifestyle imagery you may not have previously considered. 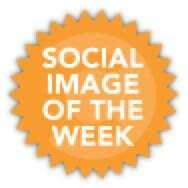 Just make sure that you fully vet any third party or user-generated content partnership out with your legal department to ensure that both groups fully understand how and where content will be used. What was your favorite social media post from the Fourth of July holiday?